I was on the boat over the weekend to enjoy some unusually warm (upper 70's) NC February days. The wind really picked up Sunday and I struggled to find the right balance of sail area. Winds began to build to 10-15mph or more and were probably gusting to 25 or more. That was what the local weather station recorded, so it was likely a little more over the water. I started with full main and 130 jib, and I then went to a reefed main and 130 jib. There were times that I could not keep the boat from rounding up in the gusts. She would heel like crazy, the weather helm would become very apparent, and then she would round up. I didn't feel in control. Eventually I took down the jib and just sailed under a reefed main. It was much more comfortable. So.... what to you fly for certain wind strengths? When do you reef? Should I just not bother with a head sail when it is approaching the 20's? Should I look into getting a smaller jib? Any advice or comments are appreciated. I have only been sailing a few years, and am self taught, so take anything I say with several grains of salt. 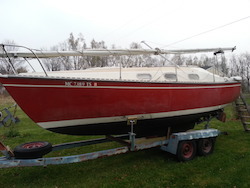 That said, I like talking about sailing while my boat is sitting on the trailer covered in ice here in Michigan. I sailed my 26 across Lake Huron this summer from Presque Isle to Meldrum Bay on Manitoulin Island. It was a beautiful sail across the lake. As we neared the channel between Cockburn Island, and Meldrum bay the sun set, and the wind really started to pick up. I had a big 135 genoa with a wire luff on a roller furler. The problem is you can't reef the sail with that type of furler. So I furled it, took it down, and put up a small storm jib I bought on E-bay before the trip (I am very glad I did!). Things were better, but the wind continued to build, and I reefed the main next. About halfway through the channel the waves were awful, the wind had increased, and I was puking. I decided to dump the main entirely. I did, returned to the cockpit, and although the motion was easier I very quickly realized that I now could not point high enough into the wind to keep from ending up on the lee shore. To say I was bummed would be a huge understatement. I climbed back out, and hoisted the main again, and we eventually made it around the island. It was a lesson for me about sail balance and how the main is needed to point upwind. All of that said, I never had any problem with the boat rounding up. I have previously owned a MacGreggor 22 which in high wind rounded up like crazy, and never felt terribly in control. I really like the Chrysler as it feels so much more stable, and in control. I assume the lack of rounding up has to do with the substantial keel trunk and the higher aspect main. Hopefully some more knowledgeable sailors will chime in to help you, but it sounds to me like you had way too much jib up for those wind conditions. I tend to think of the main as being the sail that will round me up, as its center of effort is more aft, but from what I read, rounding up has a lot to do with the rudder angle. Even if the rudder doesn't leave the water, as you heel over the increased angle greatly diminishes the effectiveness of your rudder, causing you to loose control and round up. So I would think that flying a smaller jib, or reefing the one you have might keep you more upright and help prevent the rounding up. IMO as a novice going through similar real time learning, I'd have started with a smaller jib (~110-90) and full main with those starting condition. Then if/when winds increased I could go to a reefed main and still have some balance. I tried sailing with only a 110 jib (no main) last summer just as a trial and had similar problems to yours. When I discussed with some experts they pointed out the necessity of a main. But, I'm a novice and defer to anyone more experienced. Thanks! I'm a novice on the big boats as well. Most of my experience is on a hobie 16 and that is a different animal all together. It's similar in many ways and very different in others. I'm hooked on the big boats though. I still love my cat, but I sure do spend a lot of time on that Chrysler. It just opens up so many more experiences and learning opportunities. I just had a thought... I wonder if I could use an old hobie 16 jib as a storm sail??? I'd have to compare them, but I'm pretty sure the hobie's is much smaller. A sail from the Hobie should work. As long as you get the size you want, and the material is a decent weight. The storm sail I bought was from a larger boat, but it worked well for what I wanted, which was just a smaller jib for high winds.